Dan Knott played under the legendary Jock McHale, and his father-in-law Steve Vallance reports he often spoke of the respect the players had for its greatest ever coach. He played during the war years, and as such was only available during his leave from the Army, which saw him based in the Northern Territory. The Knott family was heavily involved in sport. 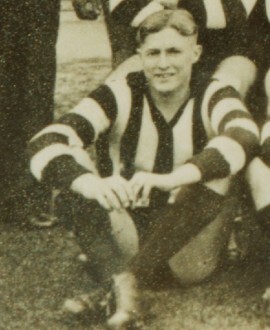 His brother, Arch, played 49 games for Fitzroy and St Kilda while another brother, George, was an Olympic athlete and the Mayor of Collingwood. Dan ran the Yorkshire Stingo, a pub in Collingwood, for several years and according to his father-in-law spoke of the busy times after the football during the early close period.